With the 6071A Programmable Synthesized RF Signal Generator you get the precision resolution and settability of a high-end synthesizer with the low-noise performance of a top-of-the-line signal generator! 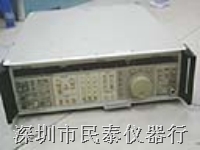 Offering twice the output frequency of the famous Fluke 6070A, the 6071A covers the frequency range from 200kHz to 1040MHz. Make sophisticated tests and measurements rapidly and with great precision. On VHF and UHF receivers you can measure selectivity, sensitivity, intermodulation distortion, AM rejection, AGC response, audio hum, noise and distortion, and SINAD ratio. Leveled output available from -140 dBm to +19 dBm (to 520MHz), -140 dBm to +13 dBm (above 520MHz). Non-harmonic spurious outputs: -90 dBc to -100 dBc to 520MHz and -84 dBc above 520MHz. IEEE-488 interface and simple programming commands make this generator an excellent choice for ATE systems.